The Meditub 3060-BL Step in Tub is uniquely designed to allow you to keep the existing layout of your bathroom. It features an advanced watertight, walk-in tub door system for easy access. You can lie back and be fully immersed in a whirlpool while relaxing in the salubrious experience. 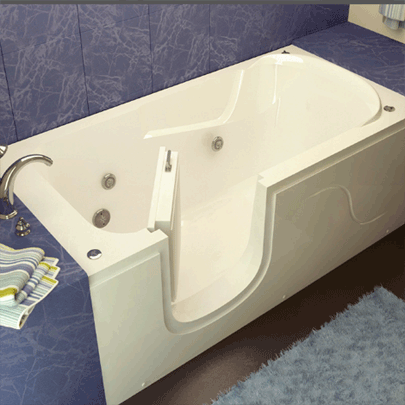 The open interior of the tub is free of any seat which allows for a flat, full bodied submersion. Made of reinforced acrylic. Deluxe Hydro massage system one horse power pump with directional water jets. The Deluxe whirlpool massages system includes six 360° directional water jets. Each individual water jet is also fully adjustable as far as pressure or velocity of water. Hydro system includes Inline Heater rated at 15 Amps 125 Volts AC, 1 Nema Plug.